UNITED STATES: Between 4GW and 7.7GW of potential capacity could be tapped by 2030 if coastal states between Maine and Maryland committed to offshore wind, a trio of reports have concluded. Building and maintaining this capacity would create tens of thousands of jobs, many of which could be reserved for US workers, according to one report. It could also prompt investment in US factories and vessels needed to comply with a nearly 100-year-old law prohibiting foreign ships transporting cargo to or from US ports, another suggested. But without political intervention, even a low 4GW trajectory would be unfeasible, according to a third report, Northeast Offshore Wind Regional Market Characterisation. The report, along with US Job Creation in Offshore Wind and US Jones Act Compliant Offshore Wind Turbine Installation Vessel, were commissioned by a group led by the Clean Energy States Alliance (CESA) building a roadmap to help kick-start the US’ fledgling offshore wind sector. 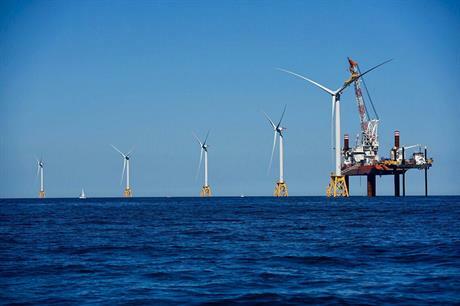 The five-turbine, 30MW Block Island project off the coast of Rhode Island is the US’ only offshore wind farm to date, but states including North Carolina and New York have expressed desires to build more. Additionally, several projects with 1GW-plus capacities have been planned. In 2015, the US Department of Energy awarded the New York State Energy Research and Development Authority (NYSERDA) a $592,000 grant for the multi-state project. Three reports the group commissioned were publicly released this month. According to US Job Creation in Offshore Wind, building and maintaining offshore capacity of 8GW could create at least 16,000 ten-year jobs, for which there would be "no compelling reasons" why the work would not be performed by US workers, by 2028. This high scenario would also trigger more investment in new factories and vessels in the US, its authors from renewable energy consultants BVG Associates suggested. American-made installation vessels or feeder barges would be needed to comply with the 1920 Jones Act, which requires any vessel transporting cargo between US ports, or between US ports and offshore facilities, to have been built and flagged in the US, according to the US Jones Act Compliant Offshore Wind Turbine Installation Vessel report. GustoMSC, a Dutch design and engineering company, which prepared the report, stated these vessels could cost upwards of $200 million. Compliant installation vessels could be built for $222 million, or less expensive feeder barges could be constructed for $87 million. Crews would need to be involved in a pipeline of at least 3.5GW to 4GW for installation projects to be financially viable for the ship’s owner, the authors added. Policy changes focussed on increasing the deployment of renewable energy generation and reducing greenhouse gas emissions would be needed to achieve even the low scenario of 4GW by 2030, however, analysts Sustainable Energy Advantage concluded in Northeast Offshore Wind Regional Market Characterisation. Connecticut and Maine, for example, would have to increase the amount of Class 1 technologies, including wind energy and solar PV among other sources, in their renewable energy portfolio standard (RPS). In the introduction to the report, Sustainable Energy Advantage wrote: "The Atlantic coast of the northeastern United States has significant technical potential for the deployment of offshore wind power generation. "The northeast states are well-positioned to benefit from the deployment of offshore wind as a resource that can stabilise volatile energy costs, create clean energy at a scale that can contribute to replacing the region’s retiring fossil-fuelled and nuclear plants, diversifying the supply mix of a region heavily reliant on natural gas, meeting the region’s ambitious goals for addressing climate change impacts from the energy sector, and creating significant numbers of local clean energy jobs."